Greek had been the lingua franca in the Roman world in the time of Jesus. The Septuagint, the Greek translation of the Old Testament translated during the years ±250-132 B.C. had been in common use in the Christian Churches and contributed to the use of Greek as the common language of the first Churches. After the crucifixion of Christ and the resurrection, Jesus sent out the apostles into all the world to proclaim the Gospel. Because of the prosecution of the Christians by the Sanhedrin and the Scribes as well as the Pharisees and Sadducees alike, the followers of Jesus quickly spread outside the borders of Judea, especially into the Greek world. Paul played no small role in the spreading of the Gospel and the establishing of churches in the Greek speaking world. Except for the letter to the Romans, also a Greek speaking church, all the other letters were written to churches within the Greek world. Everything points to all the original autographs of the New Testament being written in Greek. Therefore the Greek manuscripts are paramount in the quest to establish the original words of the New Testament documents. The Greek witnesses of the New Testament are divided into four categories, viz. Papyri, Uncials, Minuscules and Lectionaries. Initially Greek documents were written in uncials, a large letter type akin to our capital letters. 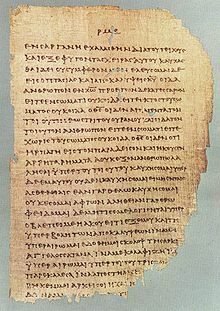 The oldest of New Testament documents were written on papyrus. 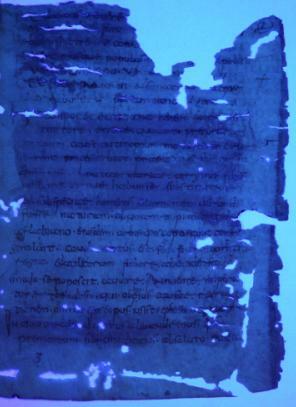 Of some of these manuscripts only parts or even fragments have survived. Yet their value as oldest documents by which later more complete documents can be compared, cannot be under estimated. They are nearest to the original autographs. No less than 127 papyri are available, 116 of them dating between the second and sixth centuries, ten in the seventh and one in the eighth century. The second group of documents is known as the uncials written on parchment or vellum. About 318 uncials dating from the fourth to the ninth centuries have survived. 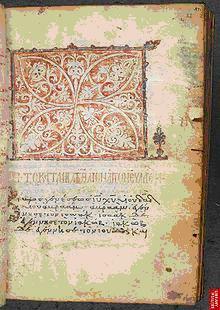 After the papiri the uncials, mostly written in neat letters are the most important witnesses of the New Testament. They usually having complete books or volumes of books, bound in codices. Palipsest under Ultra violet lighting. Wikipedia. Part of this group of uncials is called the palimpsests. As was mentioned earlier, these documents are uncials of which the original parchment had been washed and reused for another document. Some were also used in the binding of codices. Though with strain, the original can be deciphered under ultra violet light. 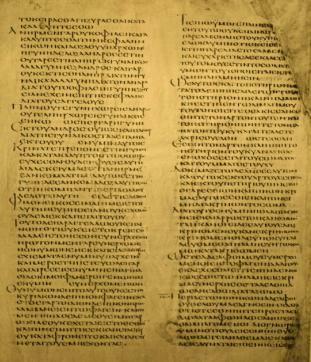 At present 52 palimpsests are known, being part of the group of uncials. Beginning of Matthew, Minuscule 485, 12th century. Wikipedia. At the beginning of the ninth century a new cursive letter type, called minuscules came into use. The letters are much smaller, needing less parchment for the same document. It was also easier to write and much quicker. About 2907 minuscules are known, dating from the ninth to the fifteenth centuries. From about the tenth to the fifteenth centuries lectionaries, also known as lectio librorum came into use. These contained specific parts of the New Testament written in one volume to assist the church in the east, using Greek and not Latin, with the orderly reading of the prescribed pericopes of Scripture on Sundays and Holy days. Although they contain only part of Scripture, the text usually dates from much earlier than the time they were actually written. This adds to their value to help discern the original autographs. About 2403 lectionaries are available. With about 5894 Greek witnesses of the New Testament to our avail, it is obvious that the original autograph of every book of the New Testament can be discerned with great certainty. This entry was posted in Lectionaries, Minuscules, Palimpsest, Papyri, Uncials. Bookmark the permalink.